Paddling a tandem canoe solo is basic stuff, but there are those who do it wrong. Take a look at the photo on the cover of The Wilderness Paddler's Handbook, by Alan S. Kesselheim, and notice how much of the boat's bow is out of the water. Now, in perfectly calm conditions, with no wind, and when you're not concerned about making time, this is okay. You'll note that it's sunset in the photo, and it's a common thing, at the end of a day of canoeing and after supper has been cleaned up, to hop in the stern by oneself and paddle idly in front of the campsite, enjoying the stillness at day's end. But throw a bit of wind into the mix, and this scenario becomes untenable. Unless you're heading dead downwind, the bow's high profile, and its lack of underwater profile to provide resistance, cause problems. Any wind will take that high, exposed bow and swing it downwind. In light to moderate winds, you'll paddle like crazy just to stay on course. In heavier winds, it becomes impossible. I recently watched an unsavvy paddler try this on a nearby pond on a stiff, gusty day. 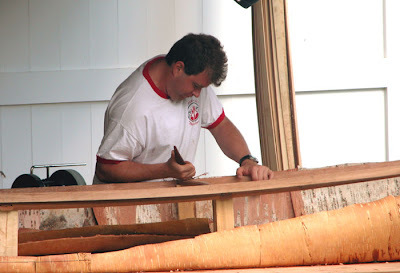 He was seated in the stern of a large, heavy, square-stern canoe, paddling like crazy to head more or less upwind. The wind would blow his bow away, and this big fellow would paddle like mad to bring it back. He looked to be a lot stronger than me, and he actually managed to swing the bow into the eye of the wind -- oops, just a couple of degrees too far, where the wind would catch the bow's other side and swing it downwind in the other direction. The paddler would switch paddling sides, paddle like mad, bring the bow back into the wind, lose it in the other direction ... over and over. It was exhausting just to watch, and he made absolutely no forward progress -- just spent all that effort trying to get the boat pointed in the right direction. In light to moderate winds, the easy solution is the sit on the bow seat, facing the stern. Because the bow seat is much further from the bow than the stern seat is from the stern (to make room for the bow paddler's legs), this places it quite a bit closer to the boat's centerpoint. By orienting yourself this way, you'll have fairly good control, with your paddle not too far behind the boat's pivot point. 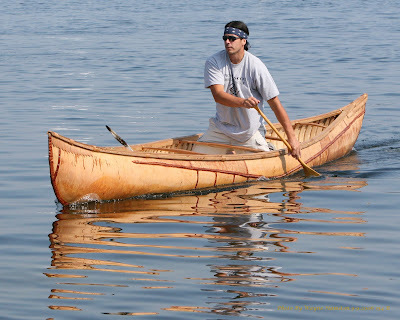 In stiffer wind, forgo the seat, move to the fore-and-aft center of the canoe, and kneel. Spread your legs and get one knee into the bilge (where the bottom curves up into the side of the hull), and lean the boat toward that side. This will position your paddle opposite the boat's natural pivot point, and allow you to hold the paddle nearly vertical with the blade as close as possible to the boat's longitudinal centerline, so that your forward stroke will produce mostly forward, and not turning, motion. Now, about that book cover: Kesselheim's book is really quite good and useful. (I put it up there with Canoeing Wild Rivers by Cliff Jacobson [which, I believe, is now titled Expedition Canoeing], and The Complete Wilderness Paddler, by James West Davidson & John Rugge.) 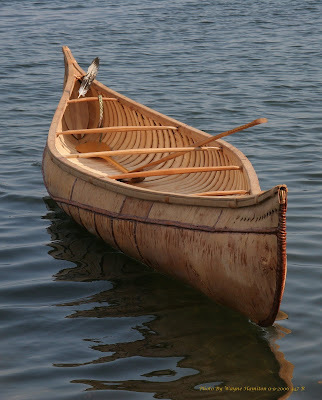 But when I worked as an editor for the book's publisher, Ragged Mountain Press (an imprint of McGraw-Hill), I received a proposal for a book to teach the rock-bottom basics of canoeing. It wasn't a strong proposal, and I rejected it. The prospective author responded by citing the cover of The Wilderness Paddler's Handbook as evidence that our existing canoeing books were no good. He evidently didn't understand that the folks who design book jackets aren't the same folks as the ones who write or edit the books. And he also didn't realize that every rule has its exception. If there's any doubt that sitting in the stern with your bow up in the air is sometimes acceptable, ask Winslow Homer. 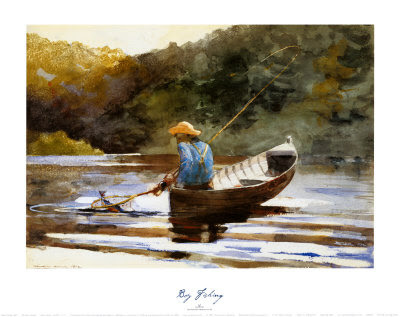 It's hard to credit that the authentic-looking outdoorsman in his painting doesn't know what he's doing, even with his bow way up in the air. Bizarre little item here taken second-hand from the book Spycraft: The Secret History of the CIA's Spytechs, from Communism to Al-Qaeda by Robert Wallace and H. Keith Melton, by way of Gizmodo.com. During the Vietnam War, the CIA used boats that looked somewhat like native coasting craft to deliver "assets," presumably to Communist-controlled areas. But should a purposeful-looking patrol boat appear, the spy-boat's crew would ditch the rig and superstructure, revealing the large speedboat beneath the disguise to make a quick getaway. What won't those spooks think up next, huh? Well, as Gizmodo notes, the concept has roots in the Q-Ships of the Second World War, and pirates have been disguising their vessels to masquerade as innocent traders probably for millennia. But I'll bet that few such preceding Trojan sailing boats were so dead-giveaway-undercanvassed as the CIA boat appears to have been. 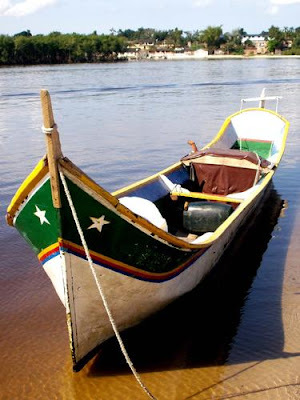 The name of the beautiful canoe posted by Celso Lück is "Ubá", and it is used for fishing. Ubá (pronounced You-Bah) is a tupi-guarani word that means "a canoe made in one piece carved from a single trunk of a tree". It is from the coast of the state of Paraná, south of the state of São Paulo. Between the two states there is a marvelous, huge preserved area of Mata Atlântica (Atlantic Forest) that forms the incredible Lagamar (The Swampy Land), on the estuary of the Rio Ribeira de Iguape. The source of this river is near the astonishing Caverna do Diabo (Devil's Cave), in the heights of the Serra do Mar. 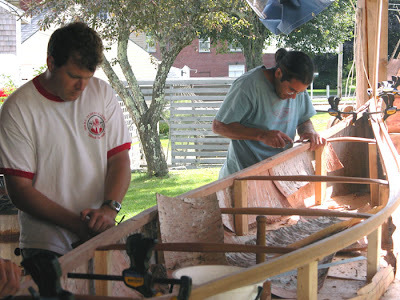 The design of this canoe is original from Paraná. 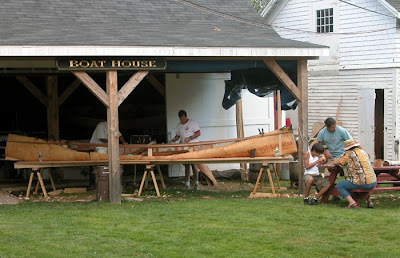 The canoemaker needs the skills and the know-how of a true sculptor. 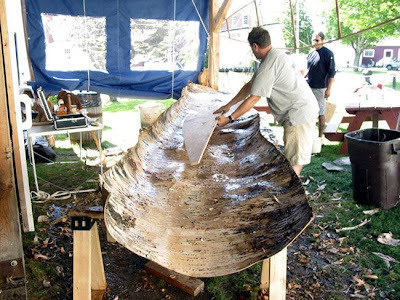 Faithful to the ancient indigenous traditions, the fishermen make their canoes by carving trunks of large trees, mainly of thick guapiruvus (Schizolodium parahybum), using only axes and hoes [blogger: adzes? ], both curved and straight. The oars [paddles? ], the fishing poles and fixtures are made of jacatirão (Tibouchina pulchra), yellow massaranduba (Mimusops brasiliensis) and caixeta (Tabebuia cassinoides), members of the rich regional Atlantic coast flora. (The information above is a mix from myself, from Celso Lück's post, and from entries of Wikipedia in Portuguese, for example http://pt.wikipedia.org/wiki/Caverna_do_diabo). This is probably the most elaborate dugout I've seen from a Western (i.e., not Pacific) culture. Note the rudder with steering lines, the elaborate fitting out with gunwales, thwarts, false stem, etc., and of course the striking paint scheme. Many thanks again , Silvio, for wonderful input!